1U.S. Army Research Laboratory (formerly Harry Diamond Laboratories), 2800 Powder Mill Road, Adelphi, Maryland 20783. 2Rochester Photonics Corporation, 330 Clay Road, Rochester, New York 14623. 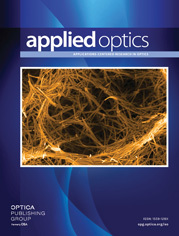 The thermal properties of lenses play an important role in the performance of optical systems. We discuss the effects of uniform temperature changes and thermal gradients on diffractive lens performance. Comparisons are made between the thermal sensitivity of refractive and diffractive lenses. Useful design equations are presented that describe focal length, phase coefficients, and diffraction efficiency as functions of temperature. We present important thermal data for a number of lens materials. The optothermal expansion coefficient is used to design athermalized lenses that combine refractive and diffractive surfaces. a Units for αg, dn/dT, xf,r, and xf,d are (×10−6 °C−1). a Units are (×10−6 °C−1).